Congratulations! You’ve exceeded your abortion expectations. 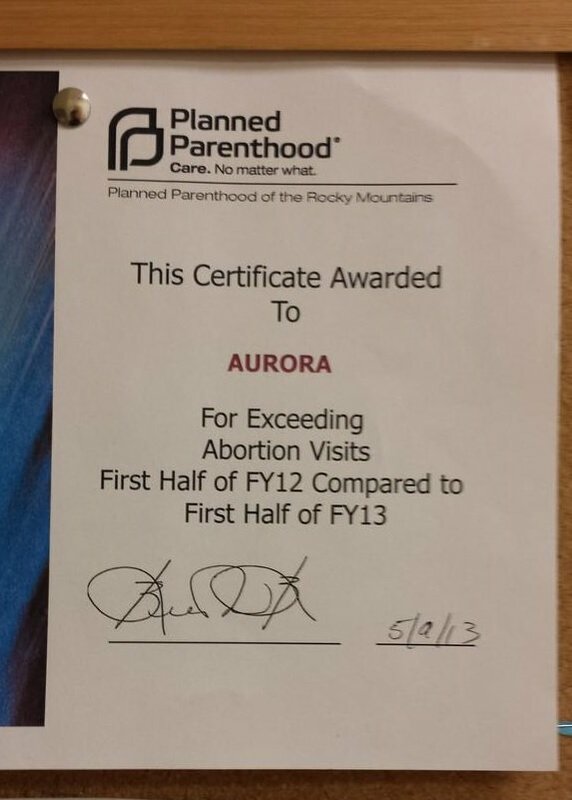 Planned Parenthood awarded an Aurora clinic a certificate for exceeding abortion expectations. Ever since I left Planned Parenthood, I have been talking about the abortion quotas that are established inside abortion facilities. Many abortion supporters refused to believe it, citing that surely Planned Parenthood wants abortion to be safe, legal and RARE. If they want something to be RARE, they certainly wouldn’t have quotas, right? We recently had a clinic worker leave the affiliate, Planned Parenthood of the Rocky Mountains. This affiliate runs the 2nd largest Planned Parenthood facility in the U.S. At this clinic in Denver, they give out various awards to their satellite clinics and post these awards on a bulletin board for everyone to see. This means that the Aurora Planned Parenthood exceeded the abortion quota that was imposed on them. And THAT is award worthy according to Planned Parenthood.